This is the third year for a summary: 2012, 2013. Our post count by year from the beginning: 2010 (13), 2011 (38), 2012 (30), 2013 (32), 2014 (47). This year, the most active of the months was September with six posts. The image shows reader activity by post for the "Past 30 days" and for "All time." In the "All time" column, "Gardners and Gardners" continues to be the post that has the most reads, overall. In 2012, this post was second. "Historical genealogy" was #1 in 2012; now, it is #3 as it was last year. "Old Planters, Beverly" kept its #2 position. It is nice that the top reads of the "Past 30 days" are recent, albeit there may be some implication there in regard to depth of reading which might indicate a need to make links more prominent. Of the issues for Gardner's BeaconTM, "Vol. II, No. 6" is on the "All time" list. For one thing, the issue had a time-line (annals) related to the lives of Thomas and Margaret. Too, it was the most lengthy of the issues, to date. We identified Elizabeth Gardner Armory as being the first to make the "1st Governor" claim. The overview (post) starts the discussion about Cape Ann's continued interest to the party after it ended up in Salem. Essentially, Thomas and Margaret got to enjoy, again and for a brief time, "their house" in an almost idyllic circumstance (American dream - no church, no state, no frictional neighbors; the life of Thomas and Margaret (as clean as Tabula Raza, if you would) offers much opportunity to more properly study and understand our modern basis). Expect more on this in 2015, as Magna Charta mania floats about. The "Andover ordeal" post was followed by publication of an article in the second issue of The Gardner Annals. 12/30/2014 - In regard to historical genealogy, see recent Comment (November 17, 2014). Update of the discussion. 12/15/2018 -- Added links to recaps from the beginning. We are adding in a feature (Pages) as it will allow collection of material in ways other than temporal or categorical. First use, Gardner Research. More to follow. 12/17/2014 - Neat, can use a tab format. 12/23/2014 -- Added Gardner's Beacon, Recent finds and What's new pages. While researching for this issue, we were looking at the movement of Gardner families southward and westward. We know that Gardners went from Salem, MA to Nantucket, for instance. Too, there was migration from Nantucket to North Caroline. In short, we know that there are descendants of Thomas Gardner in every state of the US. And, there are many Gardner families to consider. That subject is covered by our most-read post (Gardners and Gardners). As Gardner Research works to identify all families and their relationships, the starting point is the list provided by Dr. Frank A. in his book. On following Quaker migration, we ran across Gardner in New Jersey. Namely, Thomas Gardner arrived there from England in 1678. The below links provide some information about that community which was quite active. Quakers of New Jersey: Founding, Thomas Gardner house in Burlington, 1981 celebration. Some settlers were new arrivals. Others had gone back to England from New England and returned further south. The Quaker tales such as these need to be told. Introducing Janet Gardner's work: Quakers, the quiet revolutionaries. Janet has produced documentaries for several years. Her work is of interest to us. During the effort to determine the namesake of Gardiner, OR who turned out to be a descendant of George of Rhode Island, we ran across another descendant of George. Jo Ann Butler has authored books using her ancestor, Herodias, as the focus. The viewpoint is appropriate, we feel. See Vol. IV, No. 4 of Gardner's Beacon for a recap of the accomplishments for the year, for a table of contents and an index for all issues, for a brief look at the Nantucket timeline, and more. 12/14/2014 - To follow the research about the namesake of Gardiner, OR and the owner of the barque that wrecked, the Bostonian, see the post on Henry D. Gardiner. A paper that summarizes the findings to date will be published by The Gardner Annals (and will be submitted to The Essex Genealogist). Recently, we learned that H.D., and his brother C.F, were also shipbuilders. 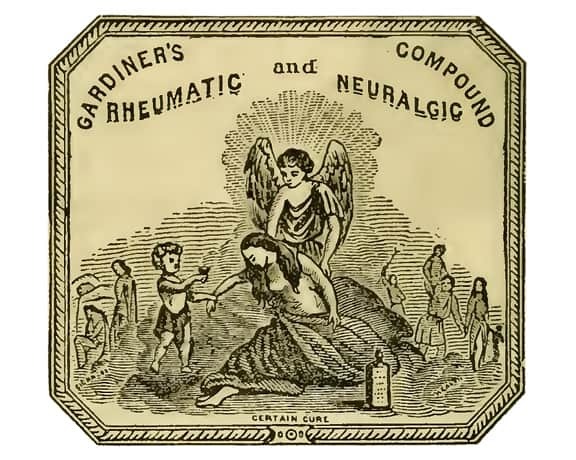 They had quite an extensive commercial business, including the marketing of Gardiner's Rheumatic & Neuralgic Compound. 03/02/2019 -- Added the image as we are building an index via images at our portal to truth. 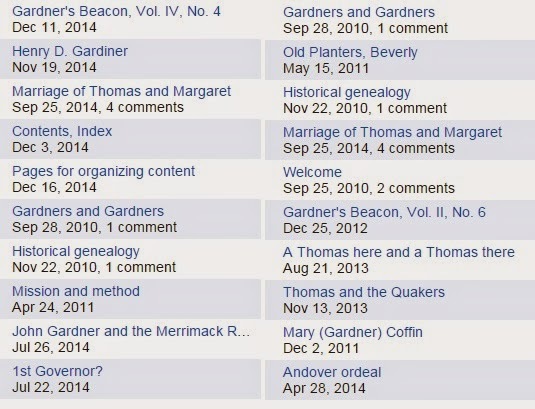 The Gardner's Beacon summary page has been updated with a Contents table and an overall Index. Vol. IV, No. 4 is in the works. In the meantime, we are prototyping an application process for descendant membership. Having submitted more than two handfuls worth of applications (all successful) in a brief time to hereditary organizations makes us very sensitive to oversights. What might these be? For one, duplication runs rampant when this is not necessary given the professionalism (even if it looks backward) of genealogy. But, there is a lot more to discuss. Who will take up the quest for a more humane treatment? 12/05/2014 - Added a table for the PDF (print) files. See Table of Contents for Vol. IV, No. 4.